Rapid technology developments in unmanned aerial vehicles (UAV/UAS) has led to drones being used for their capability to capture data in a way like never before. Don't be left behind as the use of UAVs can lead to a tremendous impact across industries. We are now in the drone era! 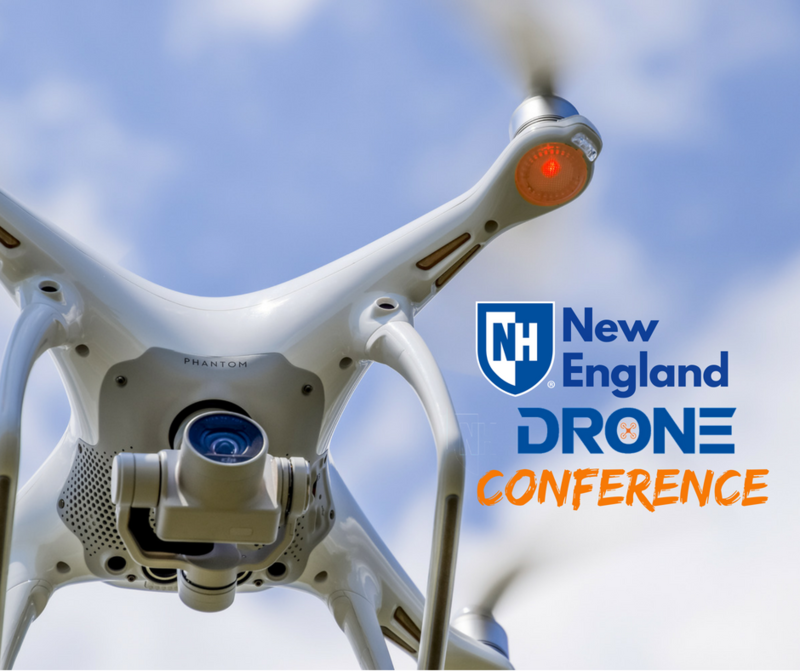 At the New England Drone Conference, you'll hear from UAV/UAS experts and trailblazers who will discuss hot button topics in drone use such as rules, regulations, laws, privacy, and security. There will also be industry specific case studies relating to drone use in natural resources, photography, mapping, surveying, and more! Conference enrollment fee includes admission to the conference, relevant conference materials, on-site parking, breakfast, and lunch. A current look at the ever-changing regulations on drones. The latest updates on state legislation as it relates to aviation and the ramifications for UAS operators. An examination of the intersection of drone operation and privacy laws. Dive deep into information on UAS, software, sensors (including LiDAR), data capture, processed deliverables and gain insight into key applications/examples. Learn how today's latest drones with Onboard high-end cameras are capturing stunning aerial photographs and videos for new end-market business applications. The 2018 UNH Digital Marketing Conference will take place in the Piscataqua Room in Holloway Commons (75 Main Street, Durham, NH) on the University of New Hampshire. Free parking will be available for all conference attendees in the UNH Campus Crossings Visitor Lot. Those registered will recieve additional information on the location and parking by email one week prior to the conference. Breakfast and lunch will be provided at the conference and is included in the cost of enrollment. Jon Budreski is a UAS (Unmanned Aerial Systems) standards subject matter expert as well as a licensed pilot. Mr. Budreski is the Co-Founder of AirShark, which has recently been acquired by American Rail Engineers Corp (ARE). AirShark focuses on providing aerial data collection and processing services in support of engineering firms and government entities. After spending 7 years in the energy industry, Jon recognized emerging opportunities with robotics, software and sensors that could assist day-to-day energy suppliers in designing and inspecting solar arrays. The advent of small UAS allowed Jon and his partners to combine their skills, interest and experience in aviation, technology and energy and create a new business from the ground up. The AirShark team currently focuses on industrial inspection and associated mapping via UAS across the United States. Originally flying under an exemption to Section 333 of the FAA Modernization and Reform Act of 2012, and now operating under the small UAS rule (part 107). A graduate of Colorado State University, Jon recently taught the first UAS course at Vermont Tech for its aviation department. Professor Hillary B. Farber is a law professor at the University of Massachusetts School of Law, Dartmouth, MA. Professor Farber’s focus is on the public and private use of unmanned aerial systems and the constitutional, legislative, and regulatory constraints that currently apply to this emerging technology. She speaks and consults nationally and internationally on the domestic use of unmanned aircraft systems. Her articles include: Eyes in the Sky: Constitutional and Regulatory Approaches to Domestic Drone Deployment, 61 Syr. L. Rev. 1 (2014); Eyes in the Sky and Privacy Concerns on the Ground, 11 The SciTech Lawyer 6-9 (2015); Keep Out: The Efficacy of Trespass, Nuisance and Privacy Torts as Applied to Drones, 33 Ga. St. U. L. Rev. 359 (2017), Protecting Homeowners’ Privacy Rights in The Age of Drones: The Role of Community Associations, 44 Fordham Urb. L. J. (2017). She is also a contributing author to the ABA’s publication Unmanned Aircraft in the National Airspace: Critical Issues, Technology, and the Law (D. Dulo, ed. 2015). Chris Huebner has over two decades of diverse aviation experience including various roles in military aviation, general aviation, government regulation, and higher education. Originally trained as a Naval Aviator, Chris currently works as the Director of Safety & Regulations for The Albers Group. Previously, he worked for the Federal Aviation Administration (FAA) as an Aviation Safety Inspector (ASI) where he was instrumental in forming the part 107 waiver application along with the associated means of compliance. Chris is also an Assistant Adjunct Professor for Embry-Riddle Aeronautical University and has authored multiple articles that appeared in FAA and Navy publications. Carol Niewola is a graduate of Michigan State University with a Bachelor’s of Science in Civil Engineering and has worked in the aviation transportation industry since 1989. Her career has included time as an airport engineer, airport planner, and project manager for a number of New England airport consulting firms, as the airport manager for the Auburn-Lewiston Municipal Airport in Auburn, Maine, and as the senior aviation planner for NHDOT/Bureau of Aeronautics for the last 12 years. In her role with the State of New Hampshire, she manages the FAA’s Airport Block Grant Program providing project and grant oversight to NH’s eligible airports. Her other duties at the State include programming airport capital improvements, safety inspections at new and existing airports, capital project oversight for NH’s aircraft rescue and firefighting training facility, and unmanned aircraft systems oversight and education.